We went to the end of busy Hardware Lane on a Thursday morning. 7:30am was Hardware Societe’s opening time with no reservations allowed. When we arrived just before 7:30 they were still setting up. Three groups including ourselves were waiting to be seated. But we all got seated quite quickly, right on 7:30am! Their flat white was weaker than the other coffees I’ve had. I probably needed two of their coffees to start the morning! My friend ordered Scrambled Eggs – chorizo, smoked paprika roasted cauliflower, onion jam, spinach and reypensar cheese. Huge serving definitely worth your money! Scrambled eggs are just under the Chorizo. Another friend ordered vegetairan baked eggs. It looked Peter when it came out. But my friend, V said it filled him all the way passed lunchtime! It was pretty but I didn’t take a photo – sorry! I ordered the Croque Madame and it was beautiful. My favourite Croque madame. 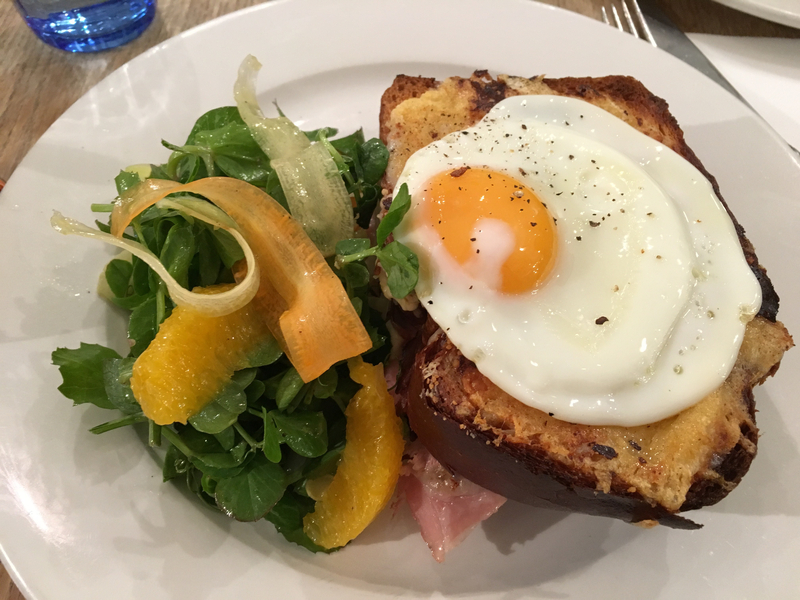 I used to love Chez Dre’s one but since they have changed management – their croque madame disappointed me. So I’m glad I found a new place fora good Croque Madame! Fried egg served on two thick and soft brioche bread. Melted cheese and ham of course! Just the right amount of sauce as well. Fennel and mandarin salad was accompaniment. You probably know my rating but now.. but I’d revisit! !